BETHLEHEM For five golden years at the start of the 20th century, the biggest soccer stars in the country lived and worked in Bethlehem, Pa. The Bethlehem Steel Co. soccer team, consisting of workers imported from the British Isles primarily for their soccer prowess, dominated their opponents from 1915 through the early 1920s, winning five U.S. Open Cups. Yet even at the height of its success, the team struggled with low attendance at home games, and never made a dime for the industrial behemoth under whose banner it played. But now, more than 80 years after the last Bethlehem Steel game, the team is enjoying a groundswell of popularity, thanks to an honorary jersey unveiled this year by the Philadelphia Union soccer team, which happens to play in another city with a rich industrial past – Chester. The black-and-white jersey, with a Bethlehem Steel logo embroidered in red on the back, was worn by Union players in the March 2 opener and has since become one of the Union’s top-selling items. To those familiar with the story of the Bethlehem Steel team, the recognition is several decades overdue. 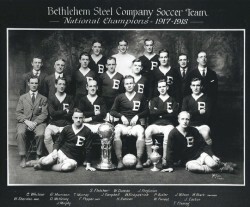 The Bethlehem Steel team began in 1907 as an amateur league team that was one of several projects funded by the steel mill, which was at the time one of the largest manufacturing companies in America. As the company prospered, it invested money in programs for employees, such as trapshooting, bowling, and soccer clubs. “They had somewhat enlightened leadership, and they felt it was important to keep employees happy,” said Daniel Morrison, an amateur historian who has studied the Bethlehem Steel team extensively. Most credit the team’s gradual transformation into a professional league to H.E. Lewis, one of the steel company’s top executives, a Welsh immigrant who had a personal interest in soccer. Lewis started pouring money into the team so it could recruit top players from England, Ireland, and Scotland, who would then come to America and be set up with jobs at the steel plant, as well as spots on the team. The jobs were often in the draft room, and involved drawing up blueprints, so as to avoid the physical dangers of working in a steel plant, said Roger Allaway, a historian for the National Soccer Hall of Fame and a former Inquirer copy editor. The team became a runaway success, often playing against corporate teams of shipbuilders or textile manufacturers, Morrison said. “They had all the money, and they were buying the best players,” he said. The team was so successful that Bethlehem Steel built its own stadium – the first soccer stadium in the country, Morrison said, which is still used today by Moravian College’s football team. But from the beginning, the team struggled to attract local support. Ticket sales were low in Bethlehem, so low that sometimes the team played games in Philadelphia to draw larger crowds. “They were the most successful team in North America, and the stands were empty,” Morrison said. Why the poor attendance? Allaway said that games were rarely, if ever, scheduled when mill employees had the day off. Additionally, the ethnic divide between the players and the rest of the mill may have been a factor. Most steel workers were from Eastern European countries and lived in South Bethlehem, he said, whereas most who played for the team came from Britain and lived in the north part of town. “Why should all these Italian and Hungarian immigrants want to see a bunch of Scottish soccer players?” he said. The low ticket sales meant the team never made money for Bethlehem Steel, despite its success. In fact, Morrison said, it cost the company money. But it remained in place until 1930, when Lewis, the team’s founder, left Bethlehem for another job. Morrison and Allaway both were thrilled by the Union’s decision to commemorate the team this year. “They want to connect the fans of today with the history that went before,” Morrison said. Sakiewicz, of the Union, is thrilled that the jerseys caught on with local soccer fans. The Municipal Market—a favorite shopping experience on E. Third St. I can still hear the sing-song voice of the peddler and fix-it man who drove through our South Bethlehem neighborhood every week. His ancient and rickety truck was loaded to overflowing with brooms, pots, pans, washboards, bolts of cloth, and tools to repair almost anything. One of the many “specialty shops” on Third St. was Cotton Crest, pictured third from the right. I thought about the boney man frequently in 2010, as the Sands Hotel took form, as a new Broughal welcomed students, and as SteelStacks moved from dream to reality. Before I lose the memory of them, I want to savor the South Bethlehem places I knew in the 1950s and ’60s. 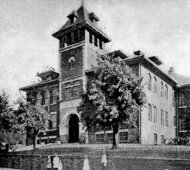 The long-gone Central Elementary School on Vine St. was built to last for centuries. Periodically, students were assembled in a large second-floor room to watch grainy black and white films warning us of the ominous threat of communism, always shown as red arrows sweeping across Europe. In frequent air raid drills, we would be quick-marched into the dark tunnels The South Bethlehem I Once Knew by Carol Dean Henn of Central’s stony basement and were told to crouch on the floor and cover our heads with our hands. Quinn School on E. Fourth St.
A few decades earlier, my mother attended Quinn School, located where the parking lot now serves St. John’s Windish Lutheran Church. Like other children of immigrants who had yet to learn English, she wore a name tag with her address on it—labeled like a piece of doors away, the delicatessen always had a free pickle from the barrel for a kid. 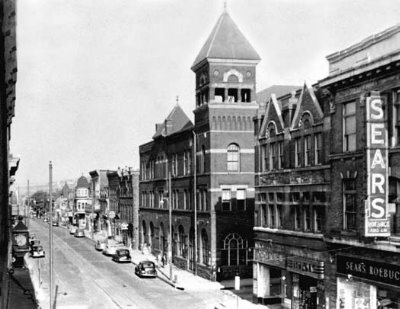 Movie theatres abounded in South Bethlehem, none more colorfully nicknamed than the “Bughouse,” officially named the Lehigh Theatre at 20 E. Fourth St. There you could see movies for 25 cents and, on Tuesday nights, get free dishes. baggage in danger of being lost in a new country. I remember almost every inch of the Municipal Market at Third and Adams Sts. 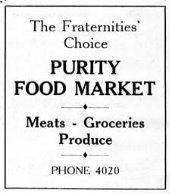 I can still picture Rich’s Produce stand, Peter Heinrich’s Sausages, and Joe Phillips’s Meats. The Bethlehem Police Department was crowded into the second floor space above the Market. Next door to the Municipal Market was the tiny A&P store, with its gigantic (to a five year-old) red coffee grinder. A few doors away, the delicatessen always had a free pickle from the barrel for a kid. 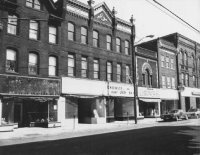 Movie theatres abounded in South Bethlehem, none more colorfully nicknamed than the “Bughouse,” officially named the Lehigh Theatre at 20 E. Fourth St. There you could see movies for 25 cents and, on Tuesday nights, get free dishes. Martin’s Furniture remains as a multi-generational icon of the area. Evans Street had cigar factories and Fourth Street had factories producing “intimate wear” for ladies. 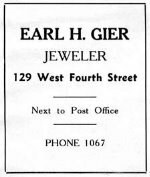 Fourth Street also offered the Royal Restaurant, Archond’s Ice Cream Parlor, Zavacky’s Shoe Repair, Dora Lee’s, Geir’s Jewelers, Devers Drug Store, the Fabric Center, the New Merchants Hotel, and always Cantelmi’s Hardware. 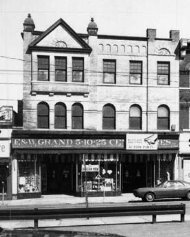 Every block seemed to have its grocery store—the Purity, Kay-Gee’s, Johnny Gregar’s, Albert’s, and Gergar’s. On Fifth St., the Roosevelt Restaurant had homemade crab patties, and Theresa’s Fillmore St. Restaurant at the corner of Fifth and Fillmore had the best food on the planet. Period. In the 1920s, my paternal grandfather owned the Globe Theatre at Fourth and Wyandotte Sts. Even in the Depression, people paid to go to the movies. My grandfather once placed an ad in the Bethlehem Globe Times announcing that “America’s only female projectionist” was showing movies at the Globe—it was only my grandmother, helping in the projection booth; but people lined up to see movies shown by a woman. I’m glad I was born at a time when back doors and front doors were left open all day, a habit my Aunt Mary on Webster St. maintained into her 80s— when people who lived six blocks away from you, knew your name and when you had to be home— when I could sit in the sun with white-haired Mr. Connell in front of Francis J. Connell’s Funeral Home and tell him all about my school day, a school day created by students’ curiosity and teachers’ skills, not by state tests. South Bethlehem produced workers for Bethlehem Steel, the Railroad, Laros, and Sure Fit, but it also produced scores of doctors, lawyers, teachers, and engineers. “South Side” children and grand-children of immigrants attended Harvard and Yale, as well as Lehigh and Moravian. I’ll offer a toast to the success of SteelStacks, but that toast will also be to the Market, the “Bughouse,” the Globe Theatre, and the magic that was small-town life in South Bethlehem. Lithograph of the second edifice of Holy Infancy, built in 1886. With an Irish labor force working on the Lehigh Valley Railroad and the iron company in the 1850s, it was not until 1861 the Most Rev. James Frederick Wood (1813- 1882), fifth bishop of the Philadelphia Diocese, established Holy Infancy as a parish in the village of Bethlehem South with permission to build a “territorial” church in the Diocese. Technically, this appointment had no bearing on its predominantly Irish congregation living in the Third Ward, or on any other of its ethnic people: Belgian, German, English, Welsh, French, Swedish, Italian or Polish. It was the “mother church,” open to all nationalities of Catholics within the territory of South Bethlehem. 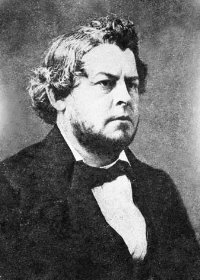 In 1862, Rev. Michael McEnroe was appointed pastor of Holy Infancy and later resided in the rectory built on the southwest corner of Locust and E. Fourth Sts. South Bethlehem’s first Burgess, James McMahon (1865-1866), a respected Irish citizen, had been an active participant in the organization of the borough’s first Catholic church. Patrick Briody, an Irish immigrant who came to America in 1850, was also a dedicated founding parishioner of Holy Infancy Church. Like him, many community leaders of Irish decent contributed to the community by the close of the century: John Donegan, Charles Quinn, James Broughal, Thomas O’Reilly, to name a few. 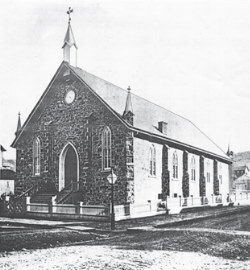 Construction of the church began in 1863; it measured 40 feet by 80 feet and was located on the corner of Locust St. (now Taylor) and E. Fourth St. It was dedicated by Bishop Wood in 1864. After its completion, a plot of 2.5 acres lying on South Mountain was donated to Holy Infancy Church by Asa Packer for a cemetery in 1867. The first interment was that of James Griffin in what is now St. Michael’s Cemetery—the burial site of at least 26 nationalities. In 1877, Rev. Philip McEnroe succeeded his brother, Michael as pastor; in time, he saw the growing congregation in need of a larger church. By 1882, Bishop Wood, now elevated to first Archbishop of Philadelphia, gave approval to begin work on the larger Holy Infancy Church to be built on the site of the existing structure. Designed by Philadelphia architect Edwin Forrest Durang, the new Gothic Revival church measured 67 feet by 147 feet and was built of stone in the Perpendicular Style. A cross topped the distinctive, centrally located 196-foot spire, later lowered and modified during WWII. The church bell was donated “to the Church of the Holy Infancy, South Bethlehem, by three friends of the pastor [Rev. McEnroe] and his people.” The donors were William W. Thurston, John Fritz and Samuel Adams. Italian immigrant painter, Philipo Costaginni. James Wohlbach headed construction, John Stewart Allam provided the church’s carpentry work and millwork was furnished by Ritter & Beck—all of South Bethlehem. The interior wall behind the altar featured three paintings: the central “Crucifixion” painted by Philipo Costaginni (1839-1904), and two others flanking it, painted by Constantino Brumidi (1805-1880)—both Italian immigrants trained at the Accademia di San Luca in Rome, Italy. When completed in 1886, the second Holy Infancy Church was dedicated by Archbishop Patrick John Ryan. Toward the end of the century, Holy Infancy Church offered Mass in languages other than English for an ever-increasing ethnically-diverse congregation. and St. Joseph (Slovenian/Windish) 1913. Today, Holy Ghost and Ss. Cyril and Methodius (now Incarnation of Our Lord Parish) are the only two Catholic churches originally founded by ethnic groups that still exist in South Bethlehem. At 150, Holy Infancy remains the first Catholic church established by the Diocese before South Bethlehem became a borough. Today, the church not only continues serving an English speaking, multi-cultural congregation but also includes its Spanish-speaking members from Mexico, the Dominican Republic, Central America and Guatemala; and Portuguese-language members from Portugal and Brazil. To mark its 150th anniversary, Holy Infancy parish celebrates with various activities planned throughout 2011. What we remember most [about the Lehigh Theater on E. Fourth St.] is that it was the cheapest theatre in town, and you could sit in there all day on one ticket. It was not very clean, but if you were collecting dishes, you Your movie ticket got you more at The Lehigh Theatre got one free dish every time you went. You dare not skip a week when the dishes were given out because you wouldn’t be able to complete the set. My mother had a beautiful set of dishes, a Renaissance ballroom scene with gold rim around the edge. As kids, we were embarrassed about where the dishes came from—but years later, they were worth something. Mother was a widow with eight of us kids, so buying a set like that was out of the question—they were our “best” set. When we went to the “Lehigh,” we would look around to see if we knew anyone before buying a ticket because we’d be embarrassed going in [to buy the dishes]. Now, it all seems so silly. South Bethlehem Hungarians fondly recalled Christmas in their native Hungary as a festive time of year when family members got together to celebrate the holiday. Candles were placed in the windows as a symbolic greeting to those absent from home, and in memory of deceased family members. The Christmas tree played a very important part in the celebration of Christmas: in the village square, as well as in the home, evergreen trees were decorated with ornaments which originated from their regions. Edibles used for tree decorations included foil-wrapped Christmas candies, cookies, apples and decorated whole walnuts. Other ornaments included wax candles and hand-crafted items. 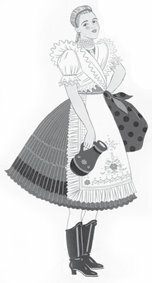 Carolers were heard as they strolled about the village, carrying a huge illuminated star and perhaps a Nativity scene. Nativity plays were very popular and could be found in almost every village. Christmas Eve was an occasion of family activity. Before the evening meal, the family gathered around the Christmas tree; after a short prayer, gifts were placed near the tree. When the first star appeared in the sky, the evening meal was served. After the meal was completed, families attended church services together, recalling the birth of Jesus Christ. Returning home from church, family members eagerly opened their Christmas gifts. Samuel Wetherill established the Pennsylvania and Lehigh Zinc Company by 1853. 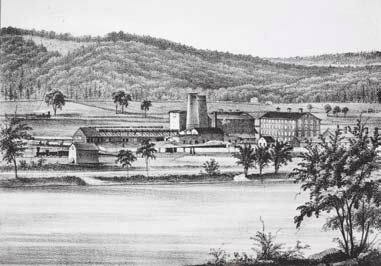 In 1848, the Moravians of Bethlehem, Northampton County, Pennsylvania, divested 1,380 acres of farmland situated along the Lehigh River, flanked by picturesque South Mountain. After the Civil War in 1865, this idyllic setting became a borough named South Bethlehem . . . a community of industrial pioneers, who, combined with ethnic immigrant labor, would impact the nation—and the world. Bethlehem, Pa. has a long and remarkable record of industrial and technological achievement. Since its earliest days as a religious enterprise of the Moravian Brethren, the practical genius of this community has left many a curious traveler awestruck. The 18th Century wooden age knowhow of millwright Henry Antes, the mechanical brilliance of 19th Century ironmaster John Fritz, and the genius of steel titan Charles Schwab in the 20th Century, are but a few of those talented individuals responsible for the industrial legacy we proudly share today. There are many others indeed. Among those oft forgotten is a man by the name of Samuel Wetherill, who came to Bethlehem from his native Philadelphia in the early 1850’s. As a descendant of one of Colonial America’s most enterprising families, Wetherill came to Bethlehem, not by chance as one might expect. Two generations of Wetherills prior to Samuel’s era pioneered the early chemicals industry in America with the production of numerous products, including white lead carbonate — an ingredient that revolutionized the manufacture of house paints globally, for both its adhesive and covering properties. Samuel came to Bethlehem hoping to extend his family’s control of the paints industry; between 1852 and 1853, he set up the first industrial colossus for the manufacture of zinc oxide — an experimental substitute for the proven, yet expensive, white lead. Wetherill supervised the construction of brick and frame structures for this purpose in 1852. The enterprise was situated on four acres, just east of the present Fahy Bridge, and employed technology both developed and patented by Wetherill himself. His “furnace process” reduced raw ore to its powdered mineral form, and his “tower process” extracted and isolated it from a sundry of impure by-products. The zinc oxide was then bagged and shipped to market. The raw materials for Wetherill’s manufactory where mined just over the ridge of South Mountain in Saucon Valley and brought to the operation along the Lehigh by packhorse and mule train. The Pennsylvania and Lehigh Zinc Company was chartered in March of 1853. On October 13 of the same year, the first “white zinc” made in the United States was made at the ZincWorks. Wetherill later pioneered the manufacture of metallic zinc spelter and sheet zinc. By 1855, Asa Packer surveyed tracks of the Lehigh Valley Railroad between the ZincWorks and the Lehigh River. By 1860, the Bethlehem Iron Company was formed east of the ZincWorks with the intent of producing rails. After the Civil War, on August 21, 1865, the Borough of South Bethlehem was incorporated. Later, the ZincWorks was absorbed into the Bethlehem Steel Company in the early 20th Century, having employed in excess of 700 persons during its peak years. Wetherill’s Southside operation is credited with bringing to South Bethlehem the first significant influx of foreign-born labor—an event synonymous with the later growth of the steel industry, vital to this community’s ethnic character. Wetherill contributed much to the South Bethlehem community, beyond being the first to capitalize upon this opportune location which would become a future industrial hub. In addition to this important contribution, Wetherill was a vigilant patriot. He organized among Bethlehem residents, a mounted guard in the summer of 1861, for three years serving the Union during the Civil War. Wetherill enlisted as Captain of H Company, 108th Pennsylvania Regiment on Sept. 25, 1861 for a 3-year term. He was promoted to Major of the 108th on October 10, 1861, and was later discharged on Oct. 1, 1864 for expiration of term with the rank of Major. On March 13, 1865, he received the rank of brevet Lieutenant Colonel. These brevets were common as the war wound down and afterwards.